WEST KELOWNA, B.C. -- Relentless forest fires burning across British Columbia may be the new normal, Premier Christy Clark warned as she stood not far from a raging fire that threatened homes in her own riding. Clark spoke near the Westside Road fire outside West Kelowna on Wednesday, where flames have forced emergency officials to issue evacuation orders to the residents of 70 homes. It's one of 10 evacuation alerts or orders across the province, where more than 250 blazes are burning, 43 of which broke out on Tuesday following a series of lightning storms. 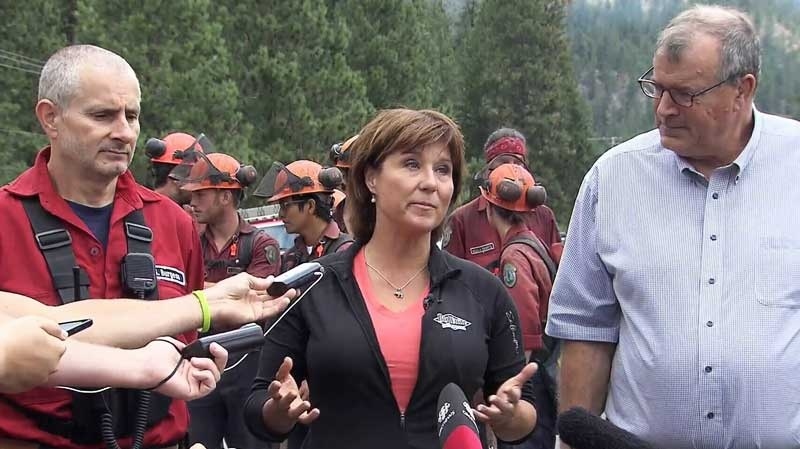 The premier said she is concerned that climate change has altered the terrain, drying out the land and making it more vulnerable to fire, and as a result what B.C. is seeing isn't unusual and will happen more often. As of Wednesday, the province has spent more than $140 million battling the 1,300 wildfires that have broken out this season, and Clark said the province could spend another $300 to $400 million this year if the pace continues. 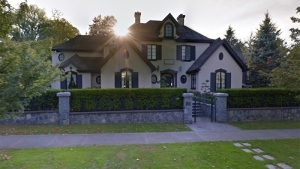 She doesn't think the fires will put the province into a deficit, because the government ran a surplus of $1.7 billion last year and is expected to run a surplus again this coming fiscal year, Clark said. "I am mostly concerned ... that the forest fire season won't give us a break and that we're going to see more homes threatened, more people's livelihood threatened, more forest resources lost." Clark said B.C. must continue to fight climate change, be better prepared for wildfires and have the necessary resources to fight them. The fire in Clark's riding is particularly unsettling because hundreds of homes were lost in 2003 when a wildfire swept through Kelowna -- just across Okanagan Lake from the current blaze. "In Kelowna, we are becoming more and more familiar with this, and so it's kind of like every summer they kind of get the band back together," said Clark. "Everybody comes to the co-ordination centre," she said. "They all know how they interrelate because sadly we are doing this every year now, but boy we do it better than anybody else in the world." About 40 per cent of wildfires are human caused, and Clark said they are considering stiffer fines for people who start fires by acting negligently, such as throwing burning cigarettes out of vehicle windows or leaving campfires unattended. Earlier this month, Forests Minister Steve Thomson said he asked his parliamentary secretary Mike Morris to review the sanctions and bring forward ideas that may deter people from "irresponsible behaviour." Glen Burgess, the incoming incident commander for the Westside Road fire, said they've been unable to contain any area of the blaze, but the number of personnel has increased three-fold since Monday. Crews have dropped fire retardant on the north and south flanks and have burned out fuels ahead of the fire, he said. Burgess said firefighters are making progress and protecting homes remains the priority.